The Complete Works of William Shakespeare – Cover and binding. To honor the 400th anniversary of William Shakespeare’s death, exhibits have been mounted worldwide. In the spring of 2016, researchers from the Los Angeles Library Foundation contacted us about Shakespeare related items for an exhibit at the Los Angeles Public Library, “America’s Shakespeare: The Bard Goes West”, now open since November 17, 2016 and running through February 26, 2017. The exhibition is in collaboration with the Folger Shakespeare Library in Washington, D.C., and includes a First Folio (1623) of Shakespeare’s works. Surprisingly, the collections at The Society of California Pioneers house a variety of items related to Shakespeare and his works. The Complete Works of William Shakespeare. Chicago and New York: Belford, Clarke & Col., 1887. SCP Archives. 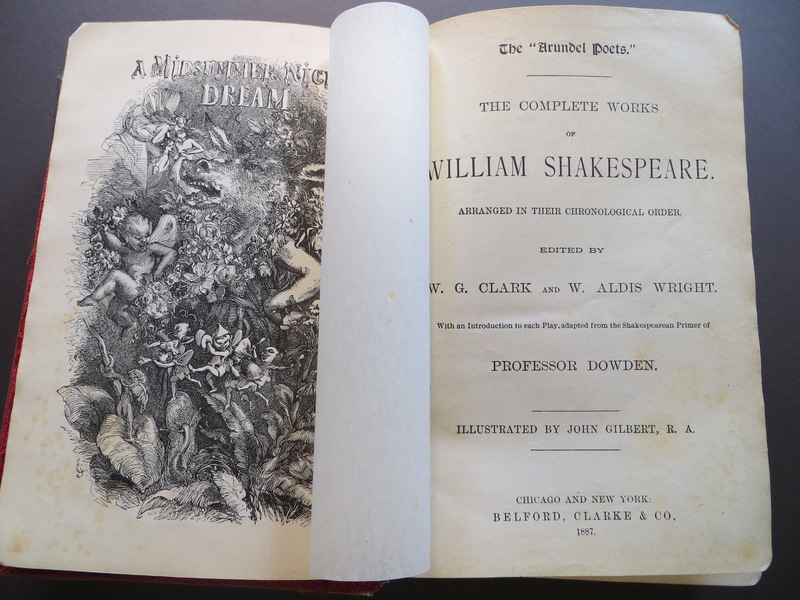 This volume of The Complete Works of William Shakespeare, published in Chicago and New York by Belford, Clarke & Co., 1887, illustrates the book’s owner’s love of Shakespeare. 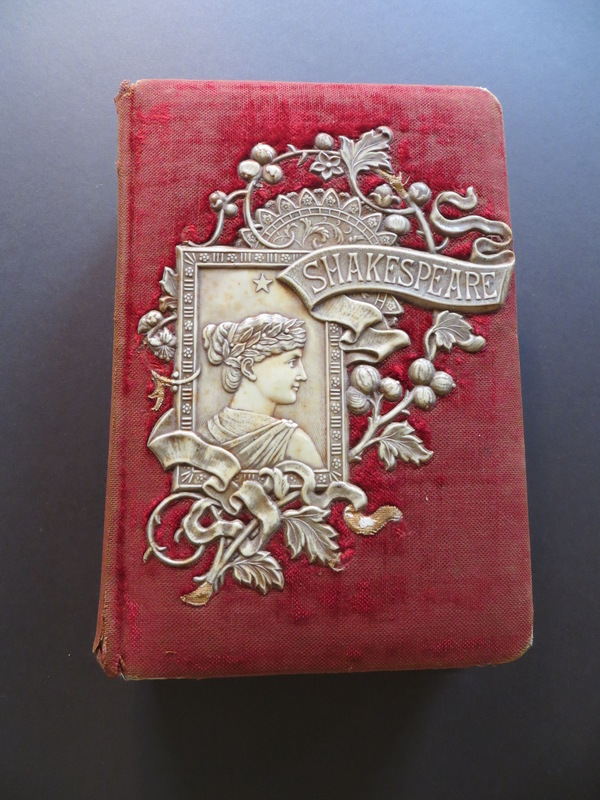 The binding, which was added by the owner, is elaborate red velvet with an floral design and a woman’s face, with the word “Shakespeare” in raised ivory on the cover. In the decade from 1850 to 1860, twenty-two of Shakespeare’s thirty-eight plays were performed in San Francisco. There were many theaters in San Francisco where Shakespeare’s, as well as other playwright’s, plays were performed. The California Theater and the Jenny Lind Theater were two theaters where Shakespearean plays were often on the bill. Theater was an important part of life for provincial San Franciscans mainly because there were very few other forms of entertainment with which it had to compete. Statistics from a search of early periodicals finds 1105 theatrical productions held in San Francisco between the years 1850 and 1860. 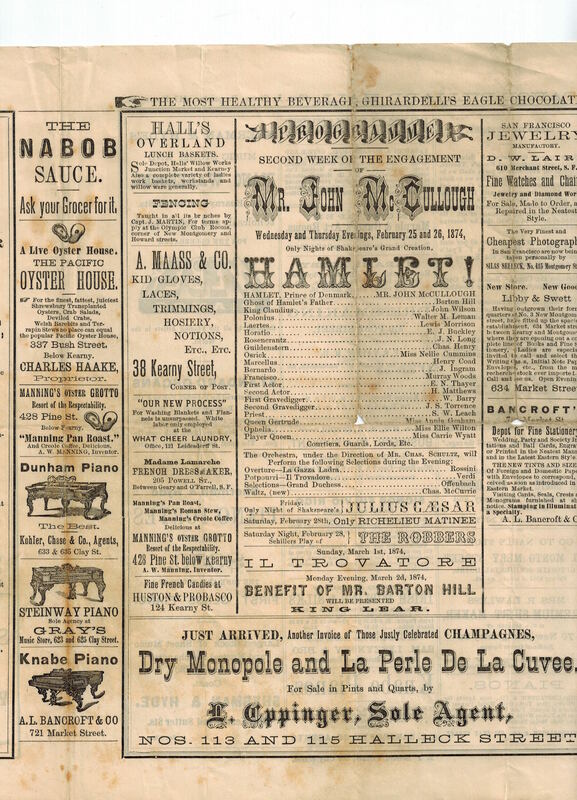 In addition to the 907 plays (Shakespeare included), there were also forty-eight operas (in five different languages), eighty-four extravaganzas, ballets or pantomimes, and sixty-six minstrel shows. Many of the performances were second-rate, staged with mediocre performers – but there were many well-known performers who made the trip to the West Coast and graced the San Francisco stages with their talents. Since The Society of California Pioneers houses the Frederick R. Sherman Music Collection, which includes not only sheet music, but also theater broadsides, playbills, programs and ephemera from the mid-19th century to the early 20th century, we knew there would be some interesting items to loan to the exhibition in Los Angeles. 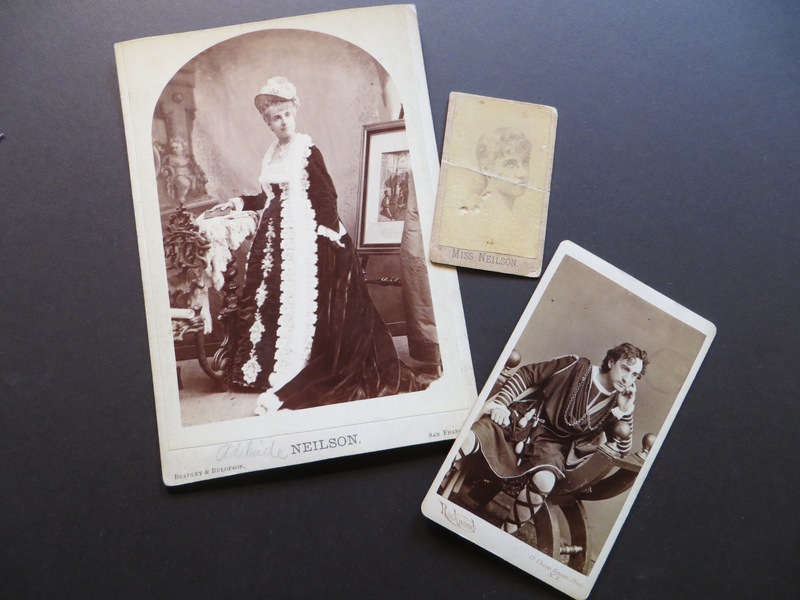 We have loaned four items to the Los Angeles exhibition, and have created an online exhibit here at the Society to showcase some of the other Shakespeare related items in both the Frederick R. Sherman Music Collection and the Actress and Singer Photograph Collection of card photographs. 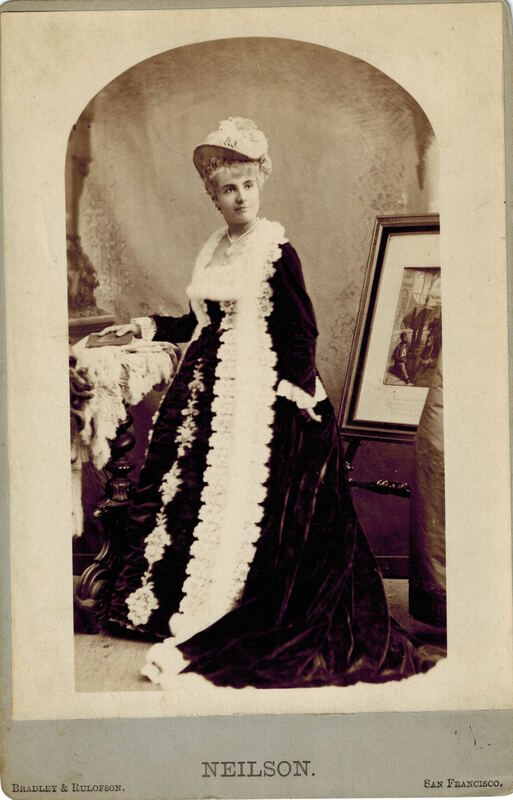 Many of the card photographs – Cabinet Cards, Boudoir Cards, and Cartes-de-Visite – feature the popular actors and actresses of early San Francisco’s theaters. A finding aid for the Actress and Singer Photograph Collection is already online at the Online Archive of California, and a finding aid for the Frederick R. Sherman Music Collection will soon be online as well. The Frederick R. Sherman Music Collection was donated to the Society by Frederick R. Sherman, founder of the San Francisco music firm, Sherman Clay & Company. The bulk of the collection is sheet music – ranging from the mid-19th century through the first quarter of the 20th century. 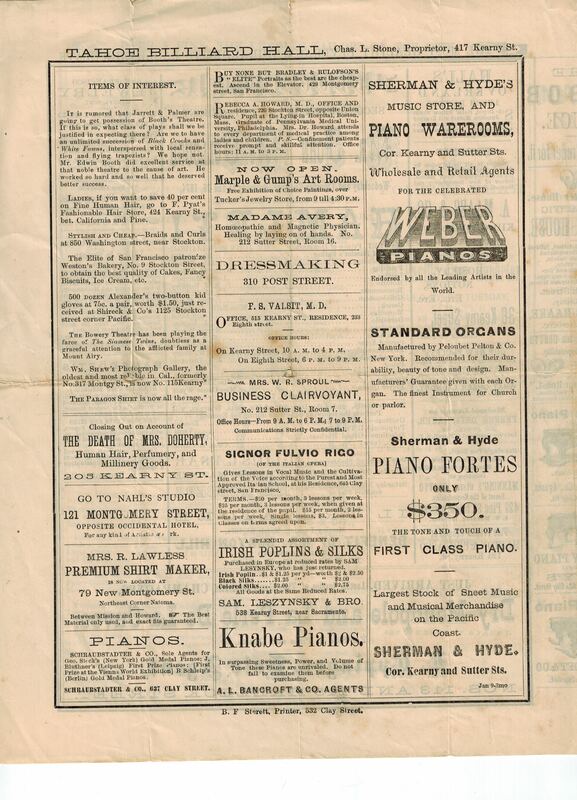 Much of the 19th century music can be searched and viewed on the website, 19th Century California Sheet Music. 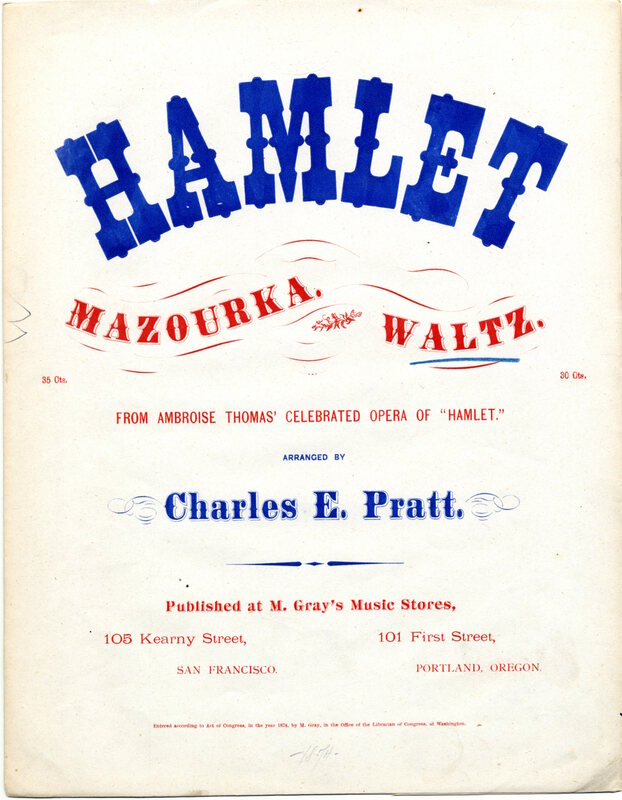 This piece, “Hamlet: Mazourka – Waltz”, is one of five pieces related to Shakespeare, this one published by M. Gray, an early music publisher in San Francisco. It was from 1874 and is from the composer’s, Ambroise Thomas, opera entitled Hamlet. 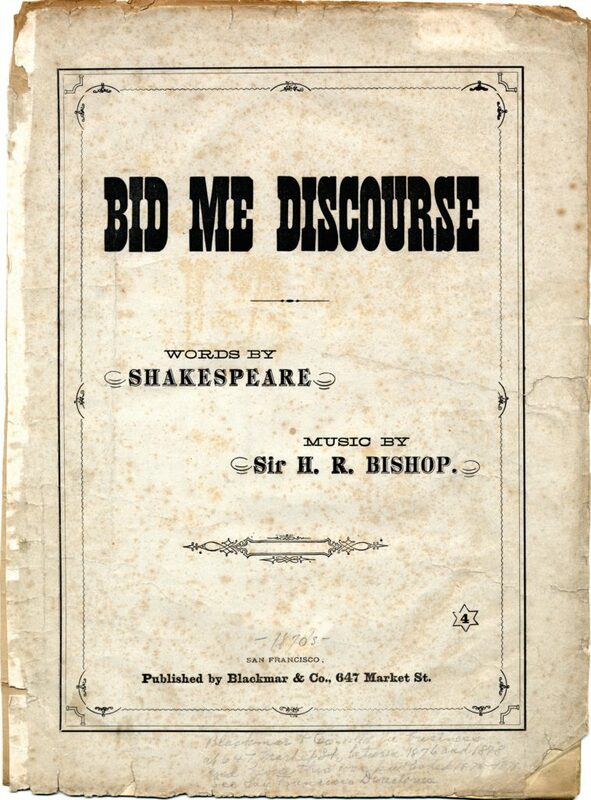 There is also the music, “Bid Me Discourse”, from one of Shakespeare’s poems. The music was written by Sir Henry Rowley Bishop (1786-1855), an English composer who composed music for a series of Shakespearean operas between 1816 and 1838. 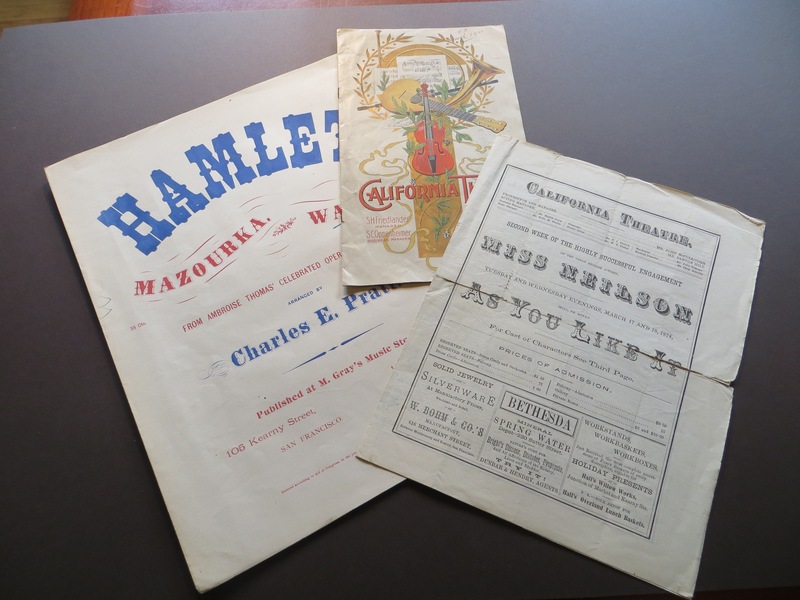 The same collection contains many playbills and theater broadsides from that era – mainly in San Francisco, but others from around the state. The Sherman Music Collection contains a variety of theater broadsides, large and small. The larger ones were meant to be posted at the theater, or as advertisements elsewhere. The smaller ones were most likely handed out to people as they passed by – again as an advertisement for the current play or musical offering. We loaned three large broadsides to the exhibit at the Los Angeles Public Library – they feature: Laura Keene in A Midsummer Nights’ Dream at the American Theater (1855), Richard III and The Merchant of Venice at the American Theater (1856), and Minstrels and a Shakespearean Festival at The Forrest Theater (1857). Broadside. 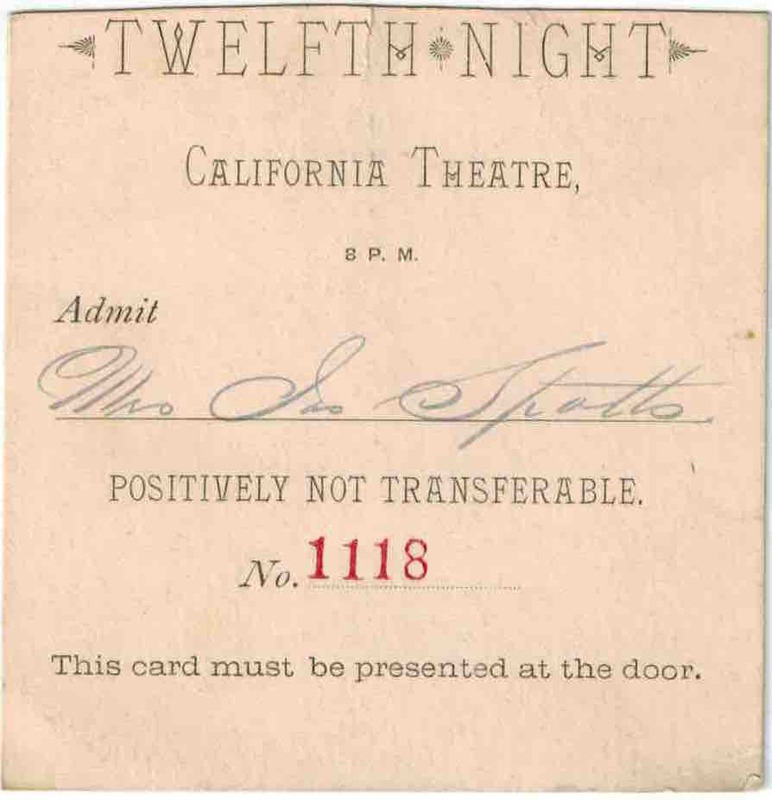 Forrest Theater (Sacramento), “Much Ado About Nothing”, n.d. Sherman Music Collection. SCP Archives. Broadside. Wood’s National Theater, Commercial Street, above Kearney (San Francisco), “Hamlet”, 1860. Sherman Music Collection. SCP Archives. Those shown above are two others from our collection illustrating the skill and variety printing houses of the time used in producing these broadsides. The first, from the Forrest Theater (Sacramento), advertised the play “Much Ado About Nothing.” Although neither of these two shown list the printer – it often was listed in small print along the bottom – some of the usual printers were: Monson & Valentine Printers on Sansome Street; Calhoun, Printer, corner of Front and Sacramento Streets; State Journal Steam Presses; and in Sacramento, State Journal Book and Job Printing Office, Third Street, between J and K Streets. The printers used a variety of fonts to catch the public’s attention, and to draw attention specifically to popular plays or musicals as well as popular performers. Julia Dean Hayne. 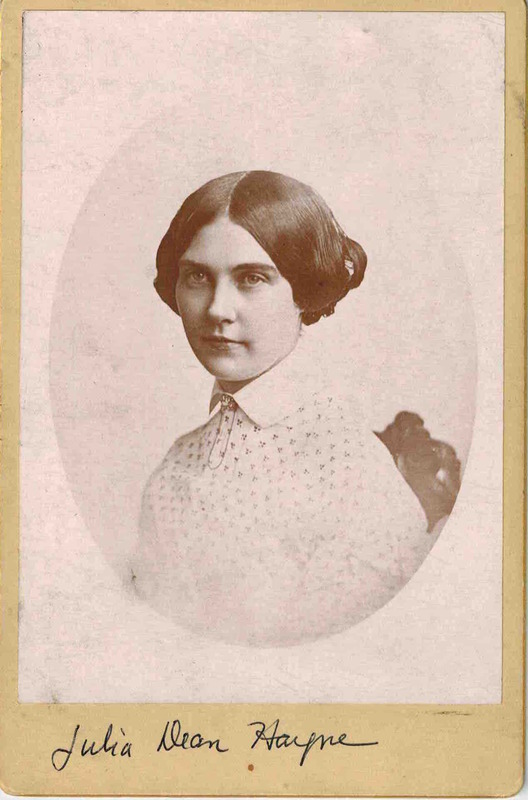 Card Photograph, Anonymous, n.d. SCP Photographic Collection. Some broadsides even incorporated images of the performer – which would have been produced by engraving the image in metal and then inserting the plate into the text in the printing press. Julia Dean Hayne, was a well-known actress who came from an theater family, both parents were actors. She began and ended her career on the East Coast, but her greatest popularity was achieved in tours of the American South and the Far West. She lived in the West for a number of years, primarily in San Francisco and Salt Lake City. Lady Macbeth was one of her leading roles. The broadside for “Hamlet”, at Wood’s National Theater, notes a Mrs. W.C. Forbes in the role of the Prince of Denmark. Mrs. Forbes was of the Potter Troupe, and although she was “well-on in years for an actress”, she was a respected performer. There were many actors and actresses in 19th century San Francisco, many of them known particularly for their Shakespearean roles. Program. California Theater, March 17 and 18, 1874. Sherman Music Collection. SCP Archives. 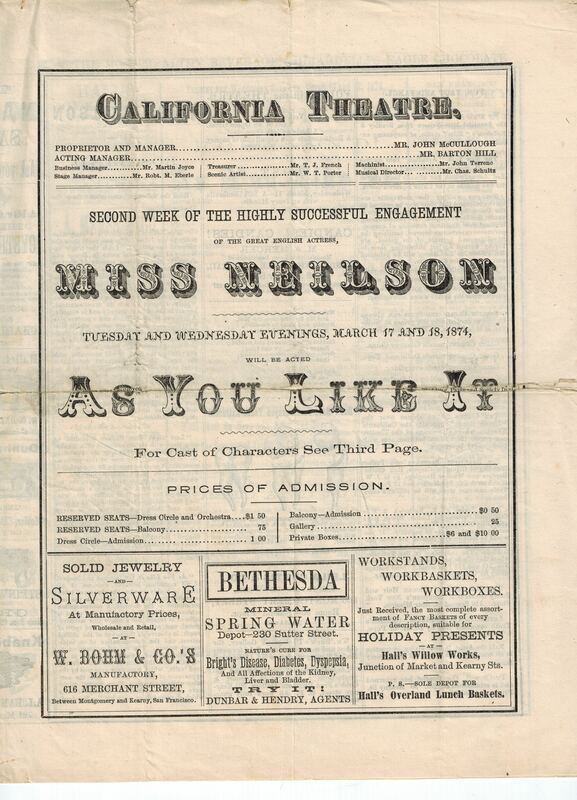 This program from the California Theater, March 17 and 18, 1874, advertises Miss Neilson in “As You Like It”. Adelaide Neilson was an English actress who came from poverty to become a well-known actress in London, New York and eventually throughout America on tours. The Shakespearean heroines she acted were Juliet, Rosalind, Viola, Beatrice, Imogen and Isabella – along with many other non-Shakespearean roles. 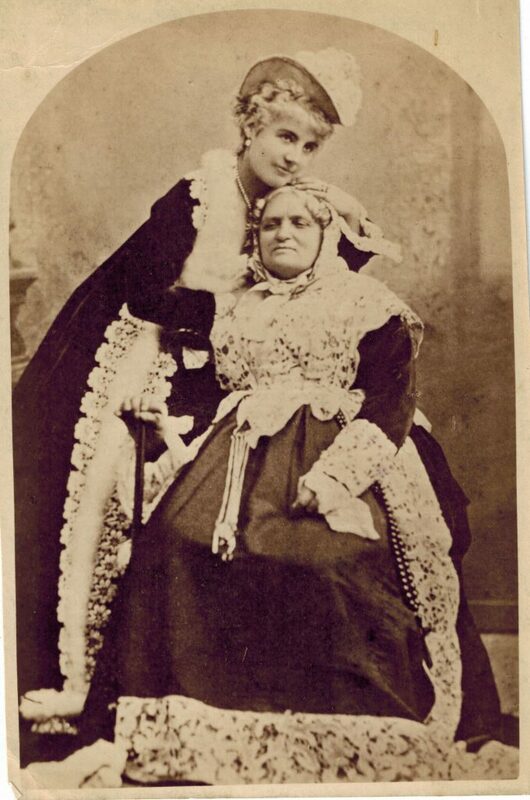 This card photograph above shows her in her role as Juliet, in “Romeo and Juliet”, with her nurse. 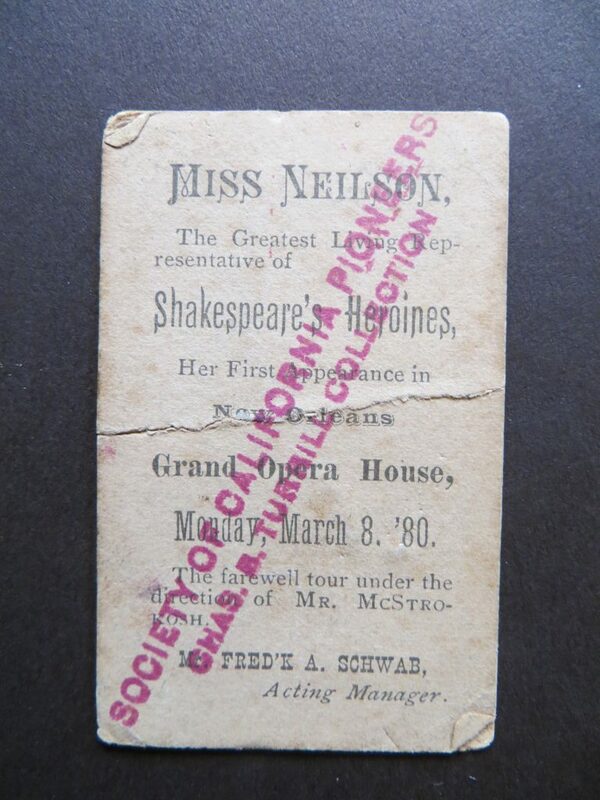 The other small card photograph of her still in her “Juliet” costume – notes on the back, that she was “Miss Neilson, The Greatest Living Representative of Shakespeare’s Heroines”. 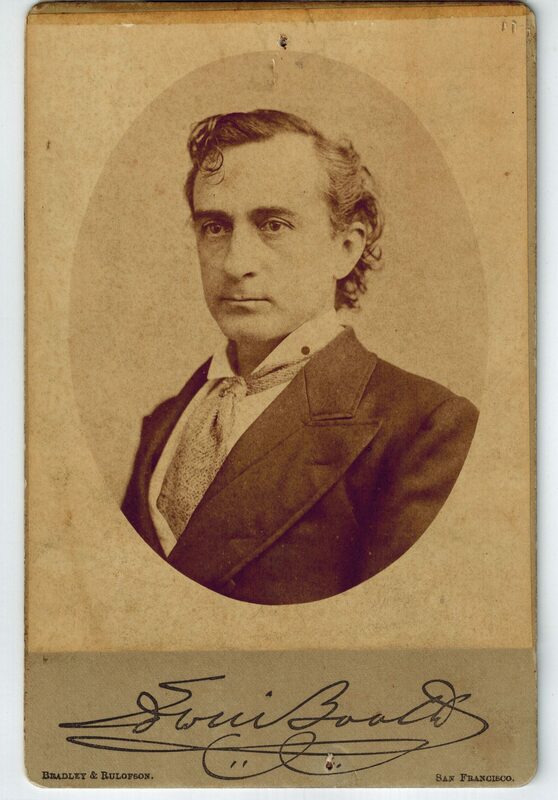 The famous actor, Edwin Booth, brother of John Wilkes Booth who assassinated President Lincoln, was thought to be America’s finest interpreter of Shakespeare. His portrayal of Hamlet was one of his best known, and this photograph shows him at his brooding best. Booth gave a quote to be printed on the back – no doubt for the benefit of his many fans. Edwin Booth. Card photograph. Verso. Mr. Booth was so popular in San Francisco, that The San Francisco News Letter, a popular publication in the 19th century, featured a reproduction of a lithograph of him, by none other than the famous San Francisco lithographers Britton, Rey & Co. 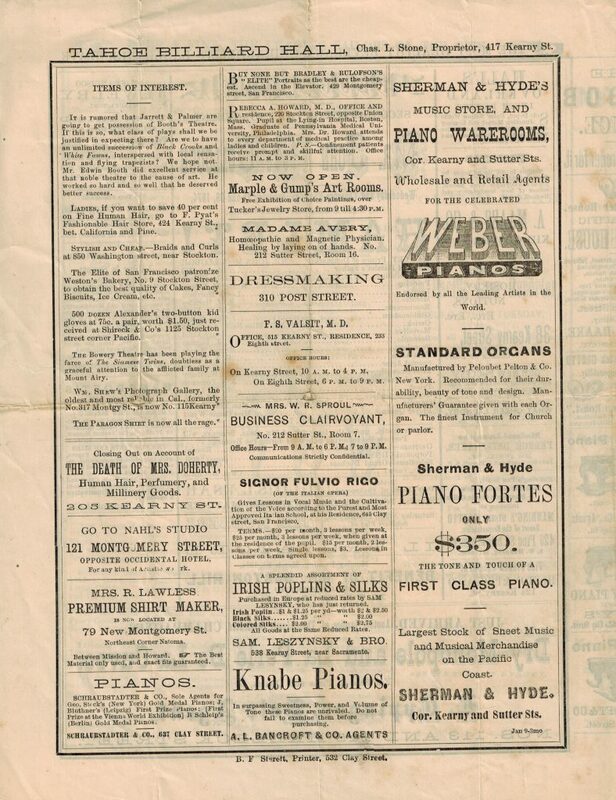 Printed for its readers as a free illustration, it notes on the bottom – “Gratis with “News Letter” Sept. 9th 1876″. The small broadside shown above, was most likely in honor of one of Edwin Booth’s upcoming farewell performances, on Friday evening, October 27, 1876. Booth had returned to San Francisco, after a thirteen-year absence, and his performances in San Francisco (1876-77), netted $32,000 in six weeks. This photograph collection showcases many of the other well-known photographers in San Francisco – Taber, Elite and Sarony. Theaters during the later half of the 19th century were numerous in San Francisco. There existed resident theater troupes, or really actors who had arrived in San Francisco with other actors. The theaters were run like a family business – the owner of the theater leased it to an actor/manager, who then hired actors, chose the plays, directed them – and often playing one of the leading roles. Acting often ran in families, and the business of theater was sometimes a family affair. The California Theater was built in 1869, by William Ralston, at a cost of $250,000 – a large sum for that era. By 1853, San Francisco had most of the major streets planked – covered with wooden planks, rather than only dirt, or if it rained, mud. Also the then population of about 35,000, mostly men, supported a dozen newspapers and more than ten theaters. 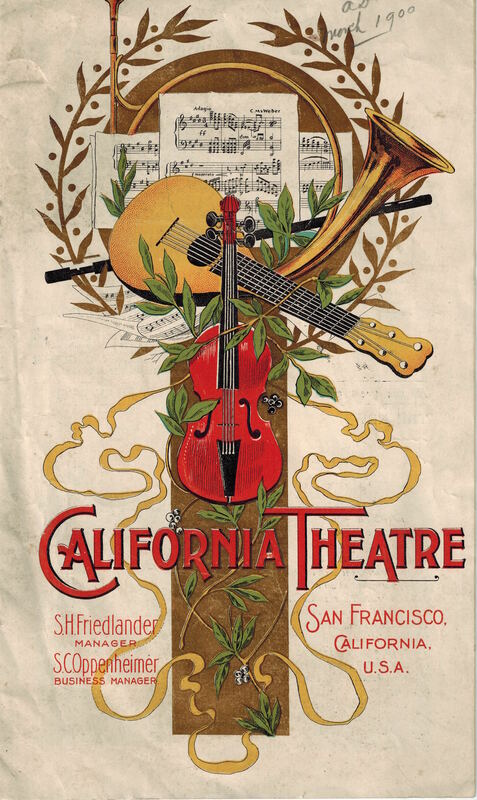 Some of these theaters – the Jenny Lind (1851), the Adelphi (1850), and the Metropolitan (1853) – were early trailblazers in mounting plays as well as music, for the early inhabitants of San Francisco. 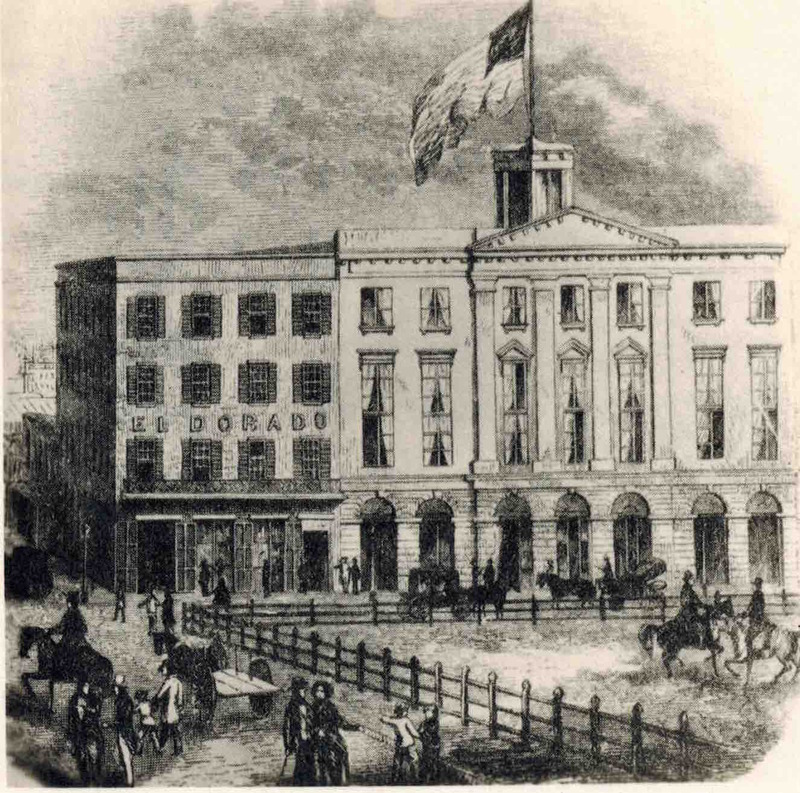 Between 1849 and 1852, there were platforms in gambling saloons that would serve as a stage, but the Adelphi was a regular theater – although it was destroyed in one of the city many early fires. The Metropolitan, described as “luxurious”, opened on Christmas Eve in 1853, with the play “School for Scandal”, and was under the management of the actress Catherine Sinclair. Later the Metropolitan was managed by Junius Brutus Booth, Jr., the brother of Edwin Booth. Edwin performed many roles, including Hamlet and Macbeth, at his brother’s theater. The programs for these theaters were chock full of advertisements, and they give a clear picture of the theater going public during this time. 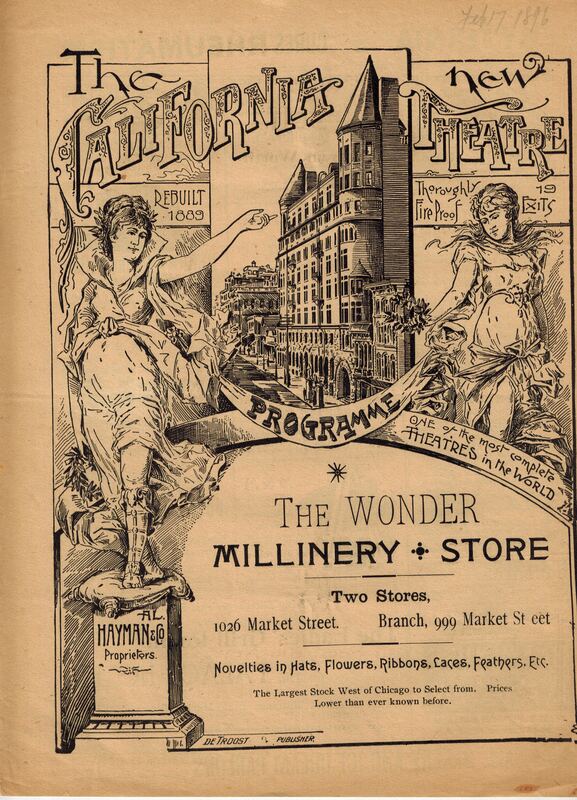 Ads for high end products, such as Champagne, oysters, ladies’ gloves, pianos, jewelry, French dressmakers and candies, and fencing lessons – all adorned the pages of each program. Familiar businesses such as Sherman and Hyde, Ghirardelli, Marple and Gump’s Art Rooms, Pacific Oyster House and A.L. Bancroft & Co. all were among the advertisers. Tickets were personalized, noting the name of the ticket buyer, and the time and theater of the performance. Shakespeare’s plays were performed already in the first decade after the arrival of the forty-niners. Twenty-two of his plays – some abridged, but many in the regular stage versions – were performed. His comedies, tragedies and histories – the most popular being Richard III – were staples of San Francisco theater. Actors and actresses of national celebrity appeared in roles, attracted by the new theaters as well as the new audiences – Shakespeare always packed the house. But Shakespeare was also performed in makeshift theaters in the mines, and in theaters outside of San Francisco, notably Sacramento. The acting profession was one which required women in many roles, and the Shakespeare canon provided this – Adelaide Neilson, as well as Julia Dean Hayne, were just a few that were drawn to the theaters of the West. 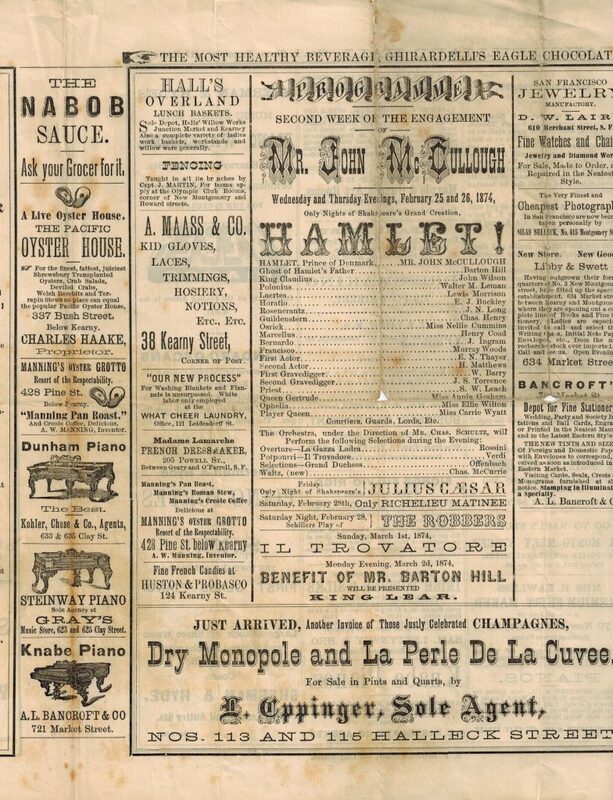 Reviews of the plays appeared in newspapers, dailies, and the theater programs themselves, as well as in the first literary magazine of the West Coast, the Pioneer (1854-55). As amazing as it may seem, Shakespeare was a part of early San Francisco’s cultural life, as San Francisco and California drew not only those seeking gold, but also those seeking fame and fortune for their acting careers. 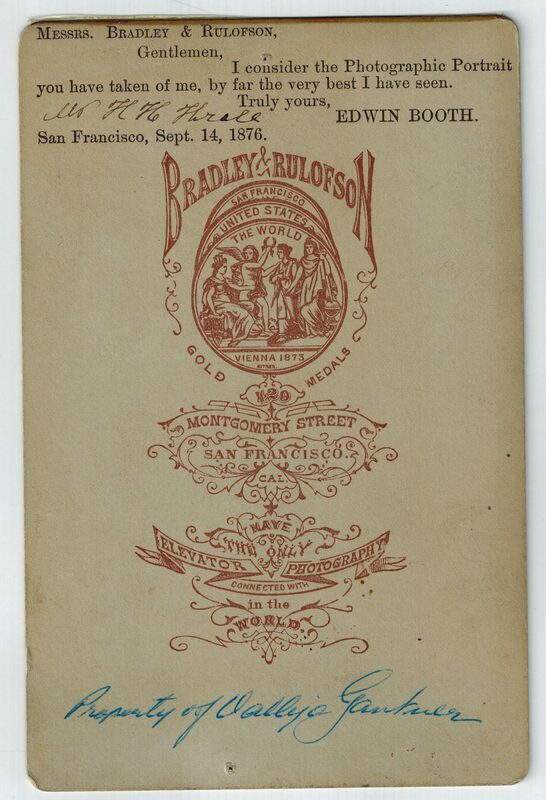 The San Francisco Stage: from Gold Rush to Golden Spike, 1849-1869. The San Francisco Performing Arts Library and Museum, Journal. 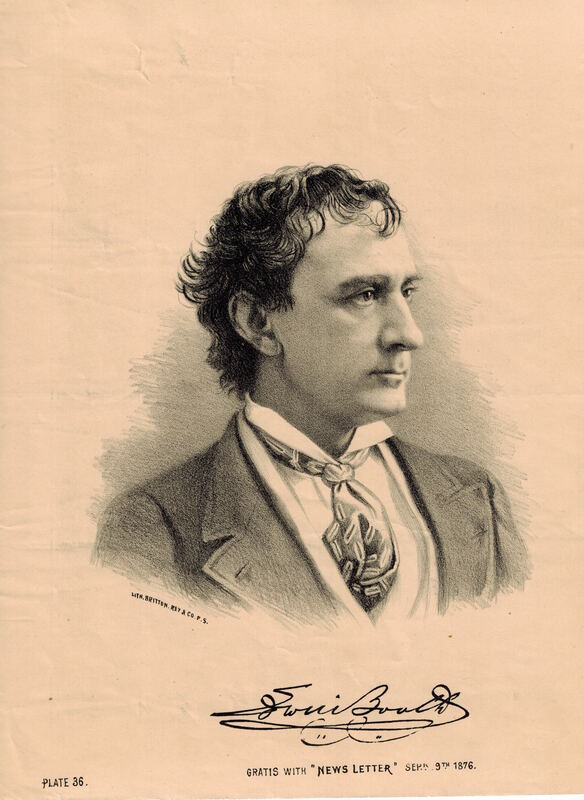 Edwin Booth: A Biography and Performance History. The San Francisco Stage: a history. The Theater of the Golden Era in California. Caldwell, Idaho: Caxton Printers, 1941. 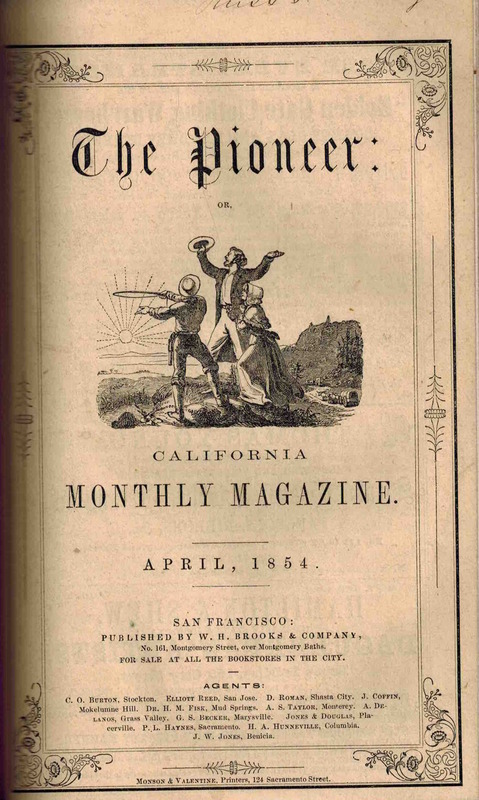 The Pioneer; or, California Monthly Magazine., Ed. F.C. Ewer. San Francisco: W.H. Brooks & Company, April 1854. San Francisco Theatre Research: Theatre Buildings., Vol. XV, part 1. San Francisco: Works Projects Administration, 1940. The Annals of San Francisco. New York: D. Appleton & Co., 1855.